Part one of an article titled ‘Why lumens are integral to effective store environments’. Over the last few years, we’ve all got to know the technicalities of LED lighting a little better, with measures such as colour temperature now a common element we look to control in almost any environment, whether that be a retail environment or the home. But as you’ll expect, there is much more to producing effective lighting for commercial environments than simply choosing the correct colour temperature. Below, we’ll guide you through one of the more challenging topics, light output. Now, you’d be forgiven for thinking that’s not all too controversial. 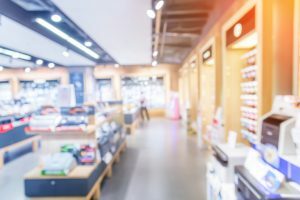 But the reality is that this forms the starting point of your entire store environment, and can affect everything from consumer psychology to the amount of overheads involved. When we talk about light output, you’ll often find lumens (or the symbol that represents it, lm) is referred to quite a bit. That’s because lumens are the SI (which stands for international system of units) of luminous flux, a measure of the visible light emitted from a light source. Ok, let’s step back for a minute so we’re clear. So the higher the lumens, the brighter the light source. Now we’ve got that covered, we’ll add one more technical term into the mix. ‘Lux’ is a measure of lumens per square metre, and is a practical term used by lighting designers and architects when looking at light levels. It’s worth mentioning here that on many technical LED datasheets you’ll find a measure for ‘Power’. As this is measured in watts, it’s easy to think that the higher the wattage, the brighter the light output. This couldn’t be further from the truth. It simply refers to the amount of power needed per X amount of lighting, usually 1 metre. This post was created by Nick Wraith, Managing Director of retail lighting and display specialists, Unibox. For more information or guidance on retail display lighting, visit their website on www.unibox.co.uk or call 0161 655 2100.